A join venture with Marco Neiva lead to a great and successful launch, that took a Portuguese national symbol higher than ever. Obtain the best images we could possibly obtain of the rooster in Near Space. Film the Balloon in order to view the inflation, the moment of the burst and the parachute efficiency. Test the mounting rig used for filming objects in the balloon with the earth in the background. Completely test the electronics. We made a few changes and we were really hoping that this time all the equipment would work correctly (fingers crossed). Test a tiny bird tracking UHF Beacon. 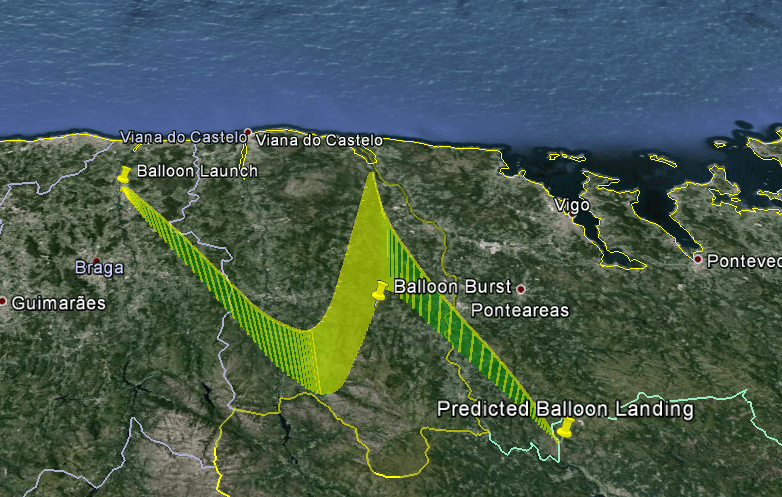 Compare and validate once again the flight prediction tool. 4 temperature sensors – 3x One Wire Digital Temperature Sensor – DS18B20 (outside, inside wall, inside “floating”) and 1x analog Low Voltage Temperature Sensors – TMP36 (soldered on the PCB). The SPOT satellite GPS Messenger was placed in a different styrofoam box a couple meters away from the primary payload where the other GPS receiver is. The RTTY beacon was placed in other different box below SPOT, simply sending the GPS coordinates through 434MHz in RTTY. Finally the tiny bird tracker was the last element of the convoy, below the RTTY box. 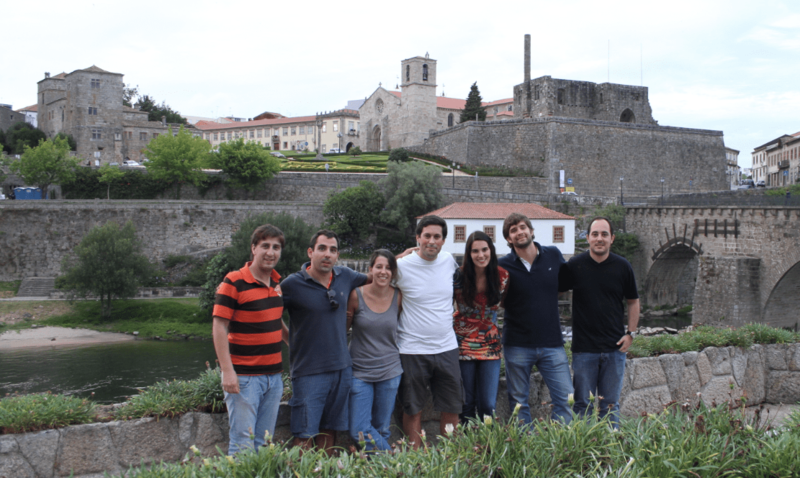 The launch was made in Barcelos with authorization and in cooperation with Marco Neiva and the Association of artisans from Barcelos. 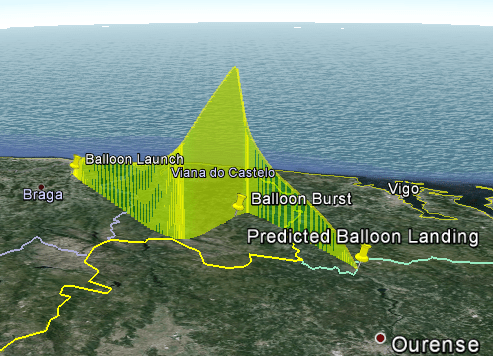 The Land predictions pointed us for an “LZ” in Spain. Checking weather reports and confirming the balloon trajectory. Prior to the day of the launch we took a car ride to Barcelos, early in the morning, to meet Marco and settle down for the night. 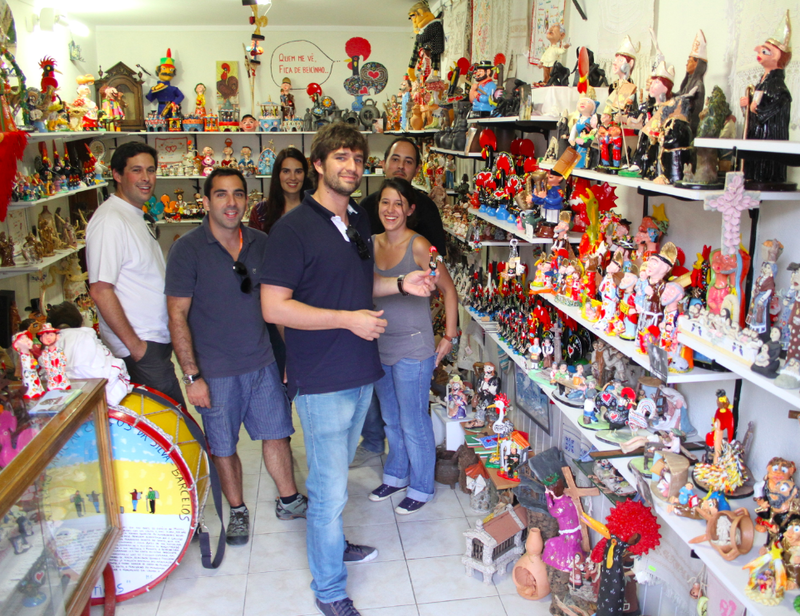 Once there we met Marco and the artisans there which told us that our launch was going to be part of the village celebrations and that we were going to have lots of audience since the local population was aware of this event. Stage frightening started to settle inside us. They also asked us if we could take as payload some pieces of paper that kids from a local school wrote to take to near space. Later on we had dinner and headed to the house we were going to stay. We ended up working until late in the night preparing everything. We arrived early at the place of the launch. A beautiful location with lots of people watching us and waiting for the balloon to be filled and launched. We unloaded the cars and filled filled the floor with our bags and boxes. We followed the checklist exactly! We start laying a plastic on the floor and putting our surgeon rubber gloves on, Dário, Anabela and Carolina started working on filling the balloon while Duarte concentrated on connecting both payload boxes to the parachute, Rui was responsible for the cameras and the rooster placement. Diogo was busy setting up the actual payload and the electronics. The Kenwood radio was tested, the APRS and SPOT tracker websites on the ipad were also tested. In the end flight batteries were fitted in, the payload box was closed, cameras are on, WE ARE READY TO GO! We made the call asking for the permission to launch and we were asked to wait…=(. That’s right, Dário was going to hold the balloon a little longer than expected. And we waited,… waited,… waited,… more than half an hour… but then the authorization came! Meanwhile all the communication systems on the payload were communicating, so I guess that’s a good thing! We took positions holding this long convoy of boxes. We warned the people watching that this was going to be the moment and there he went. 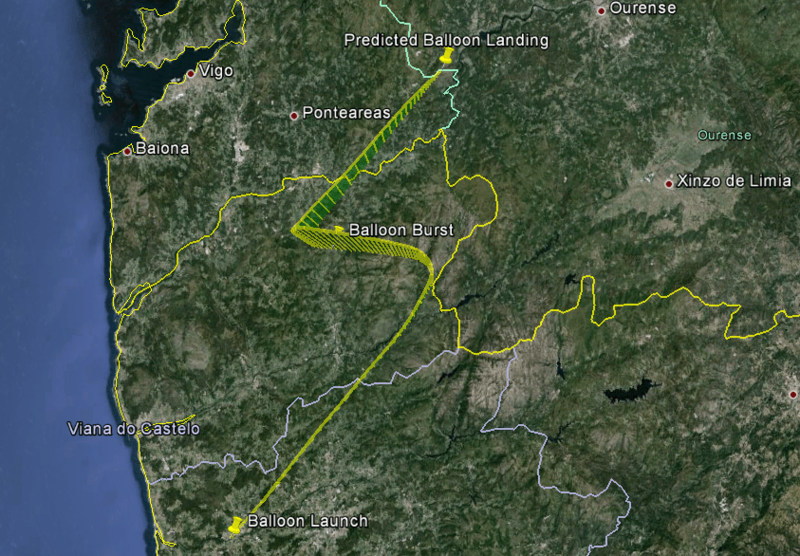 BALUA-BARCELOS IS AIRBONE! But there was a little problem, the payload was a little heavy and the lift produced by the balloon was not enough to quickly lift such a long convoy of boxes. In the end we watched the lower box (RTTY) hit the wall with a bang. We learned that in that moment, never again. We start packing everything up and travelling in the direction of the predicted landing site. As time goes by we started receiving the APRS packages and the SPOT GPS points. the RTTY beacon never worked. The crash against the wall probably destroyed the RTTY tracker. However with both APRS and SPOT signals working we were good to go and more importantly we were able to confirm that the flight path was according to the one predicted. Did it land on water? Did it land somewhere without GPS coverage or in such a way that the GPS can’t “see” the satellites? Was it stolen and is held inside a house? We started questioning everything but at same time we went to that last GPS point location. This last point was inside a little spanish village in the mountains. The stolen idea started to appear more likely. We took a yagi antenna out, which was calibrated to the bird tracking beacon frequency and started drawing azimuth lines to check the direction of the beeps given by the beacon. Weirdly enough the signal caught by the yagi was very weak, almost like if the payload was still very far away. Later we found out that this weak signal was because at the moment of the launch the antenna of the beacon got broken against the same wall where the RTTY beacon box also broke. Either we started tracking the payload “old school” way with a yagi. It had to be close by! We were on to it and we were going to start hitting doors and asking people. When we were passing some houses someone asked Diogo what was he looking for? Diogo told the man that we were looking for a box with cameras (We used a mixture of spanish-italian-portuguese-gibbirish language to communicate, not a proud moment). The man told us that he had found it, and that in fact it landed in his backyard! AWESOME!!! We went there and recovered everything. such a proud moment! We lost GPS signal because the took the box inside his house. We quickly took the SD cards out and checked the equipment. In our quick evaluation we saw. All the camera’s SD cards had videos, awesome videos! The cameras rooster rig held together fine and only broke on the landing. The log card had data. The RTTY box broke and the pcb was in pieces. The bird tracking beacon didn’t have the antenna. The SPOT was also fine and woke up again when it went outside again. The messages of the school kids were still inside the balloon. Everything was incredibly fine. Another great launch! In the end we gave the rooster to the man that found it and proceeded to return to Barcelos. In there we returned the messages and had the dinner of the kings. On the next day we said goodbye to the Marco and the artisans of Barcelos, they offered us some rooster’s to take home and called it a day. We left the videos with Marco and waited for the awesome video that would make. Launching and returning a balloon is such a thrilling experience!!! Pictures and/or movies can be found in the gallery section of this website. The convoy of boxes was very long which resulted in the launching problems we experienced. The RTTY box will probably be sacrificed in future launches since it is completely redundant, heavy and in this launch was destroyed. The bird tracking beacon associated with the prediction tool or the last GPS positions is incredibly good for fine tracking of the payload. However the antenna of the bird tracking beacon should be covered inside a casing to protect it. We should probably place a fail safe wire in the cameras to avoid loosing them in case something goes wrong (add this to the checklist). In the videos we were able to see that there was some oscillations on the videos, also the payload pendulum effect was huge. It would probably be important to test a shorter convoy with the heavy part in the head.